It was the year of the city center. With the opening of Buckhead Atlanta, Inman Park’s Krog Street Market, and Alpharetta’s Avalon, restaurants opened in droves. Local chefs got a nod from the James Beard Foundation, a lime shortage caused momentary panic, and one popular pop-up signed on its first brick-and-mortar location. Read on as we remember when. Ryan Hidinger, a chef known for his supper club A Prelude to Staplehouse, passes away after a fight with gallbladder cancer. The community comes together to support his wife Jen, who founds the Giving Kitchen, a nonprofit that helps restaurant workers in need. Jen signs a lease to build their dream restaurant, Staplehouse, on Edgewood Avenue. Eleven local restaurants, restaurateurs, and chefs are named James Beard Award semifinalists. The list include Anne Quatrano (Outstanding Chef), Kimball House (Outstanding Bar Program), and Billy Allin (Best Chef Southeast). Fast-casual health restaurateur Jenny Levison opens a second location of Souper Jenny, this one in Decatur. By the end of the year, she’ll have a third, a temporary spot in Brookhaven, and plans for a fourth on the Westside. Award-winning Atlanta magazine food editor and dining critic Bill Addison announces his departure. He’s accepted a new role reviewing food nationwide for Eater. A lime shortage hits the city, causing a surge in prices. Some restaurants change their policies to only offer limes on request, while others tweak their recipes to use less of the precious fruit. Octopus Bar’s Angus Brown and Nhan Le open Lusca in Brookwood, offering Atlantans a chance to enjoy their exotic eats and creative cocktails before 10:30 p.m. Atlanta magazine contributing critic Susan Rebecca White awards it two stars. Illegal Food, the pop-up known for “the Hank” burger, is given notice that it must vacate from Joystick Gamebar in 60 days. The founders later take over the Bar Meatball space in Virginia-Highland to open a full-service restaurant. Justin Amick (an advanced sommelier and son of Concentrics restaurateur Bob Amick) opens boutique bowling alley and entertainment center the Painted Pin. Thomas Collins, formerly of Parish, leads the kitchen, while Trip Sandifer, formerly of the Spence, prepares the cocktails. Cardamom Hill, a 2013 James Beard Best New Restaurant semifinalist, closes on the Westside. Owner/chef Asha Gomez says the space couldn’t accommodate the crowds, and later opens Spice to Table, a more casual Indian spot in Studioplex. Executive chef Tyler Williams leaves his post at Woodfire Grill. He’ll go on to do a series of pop-ups around the city. After a series of short-lived positions at Seven Lamps, Article 14, and Parish, mixologist Arianne Fielder signs on to lead the bar program at Bellwoods Social House, the new Westside spot by the owner of Bite in Alpharetta. By October, Fielder has moved on to work at Craft Izakaya. Top Chef alumni Eli Kirstein opens his French-American brasserie the Luminary, the first restaurant to open in Inman Park’s Krog Street Market. Atlanta magazine contributing critic Susan Rebecca White awards it two stars. After years of delays, Buckhead Atlanta (formerly called the Streets of Buckhead) opens. Restaurants include Shake Shack, Le Bibloquet, Thirteen Pies, and Gypsy Kitchen. Avalon, Alpharetta’s first major mixed-used development, opens boasting fourteen restaurants including the El Felix, a Mex-Tex spot by celebrated restaurateur Ford Fry. Holeman & Finch makes its famous burgers—previously only sold after 10 p.m. and at weekend brunch—available on (gasp) the regular menu. A fast-casual spot dedicated to it, H&F Burger, will open in Ponce City Market in the spring. After writing about Atlanta’s restaurant scene for seventeen years, John Kessler announces his departure from the Atlanta Journal-Constitution. In late spring, he’ll be moving to Chicago, where his wife has accepted a job. No word on where he’ll land yet. Cooks & Soldiers, a Spanish restaurant by Castellucci Hospitality Group (Sugo, the Iberian Pig, and Double Zero Napoletana), opens on the Westside. A fire at OK Cafe on West Paces Ferry Road causes patrons to evacuate and the restaurant to close for an undetermined period. 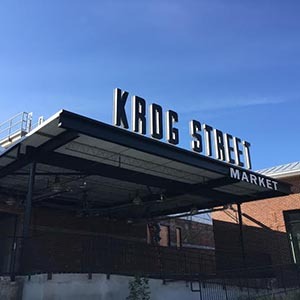 Fred’s Meat & Bread, Yalla, and Jeni’s Splendid Ice Creams are the first “market stalls” to open in Krog Street Market.